Readers may recall that last month we noted here that two reports – one written and one filmed – which appeared (and are still available) on the BBC News website failed to inform audiences of a very significant factor in the story they told. 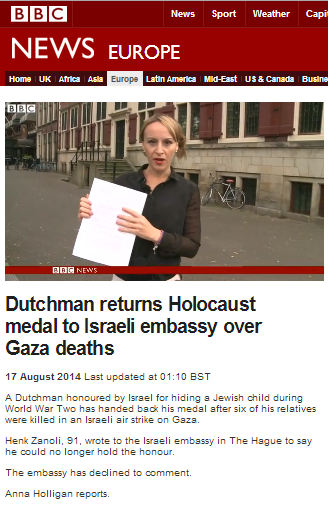 “A Dutchman honoured by Israel for hiding a Jewish child during World War Two has handed back his medal after six of his relatives were killed in an Israeli air strike on Gaza. Henk Zanoli, 91, wrote to the Israeli embassy in The Hague to say he could no longer hold the honour. His great-niece is a Dutch diplomat who is married to Palestinian economist Ismail Ziadah, who was born in a refugee camp in central Gaza. Now further research by Elder of Ziyon reveals that al Maqadma was not the only Hamas terrorist present in the Ziadah family home on July 20th. 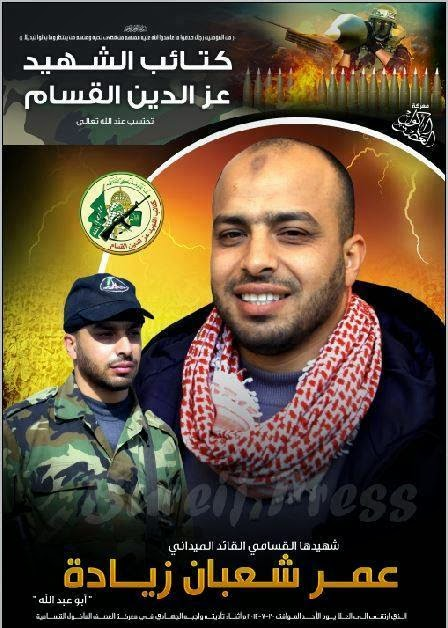 Omar Ziadah – Mr Zanoli’s great-niece’s brother-in-law – was a field commander in Hamas’ Al Qassam Brigades. BBC editorial guidelines on impartiality should mean that – having elected to amplify that very serious accusation – the BBC is now obliged to inform audiences that in fact one of Mr Zanoli’s relatives was a member of Hamas and a combatant. And perhaps the BBC’s correspondent in the Hague who produced the original filmed report might care to ask the Dutch government how a diplomat from an EU member country – in this case the Deputy Head of the Netherlands’ mission to Oman and former policy advisor on the Middle East to the Dutch MFA – happened to have a relative who was a member of a terrorist organization proscribed by the EU. From Article 4 of the 4th Geneva Convention – “Nationals of a State which is not bound by the Convention are not protected by it.”. That means that the Arab whine is totally invalid. The fault is entirely on the Arabs. Does not give you the right to bomb densely populated civilian areas, killing women and children, does it? They were military targets. The fault lies with Hamas. You seem to think that Jews have to accept being bombarded by savages, and thank them for it. Go get an education. If you can find any under your slimy rock. Yes is does Esther. If you learn to read that is EXACTLY what it states word for word. Esther if you read the above Geneva Convention article it clearly states that civilians cannot be used in order to shield military objectives. Hamas should have chosen open fields and areas that are not densely populated to shoot their missiles from. This is quite clear from the Geneva Convention article that Hamas is in breach of international law and guilty of war crimes. So it does give Israel right of retaliation. You are not a lawyer nor a founding member of these Conventions. Your personal likes or dislikes are irrelevant I am afraid to tell you from this point of view. No sane person likes killing. Self defence is another story. Yes it does, actually… Why, are you trying to encourage the Palestinian terrorists to dig deeper into densely populated civilian areas – and make more use of women and children as Human-Shields? What did you expect from the Brussels Brainwashing Corporation? Impartiality? The BBC are pro-Palestine and pro-EU. Al Beeb aren’t ‘pro-Palestinian’ any more than BDS is ‘pro-Palestinian’ . They are anti-Jews. Nearly 500 children were killed in airstrikes in Gaza this summer. The youngest one was a ten day old baby. Were they “terrorists” too in the eyes of Ms. Sela? And the four nine or ten year old kids who were killed by Israeli shelling as they played on a beach next to foreign journalists, were they terrorists in ms Sela’s eyes? So what? NATO forces killed over 100,000 children in Kosovo, Iraq and Afghanistan. Where is your outrage at NATO? How about more than 200,000 civilians murdered in Syria? Any outrage there? Of course not – the only issue is when we shoot back. Esther theses kids were in fact killed by a Hamas rocket that misfired and landed on the beach ….this has been verified officially and accepted internationally. Try and get your facts right before making accusations. The area, having been attacked “at least three times” previously, would seem to indicate a terrorist target. You don’t waste ordnance on children. There you have it — one, two, three. So it is ok to kill Mr Ziadah’s mother, three brothers, a sister-in-law and nine-year-old nephew because a militant was there? Does Ms. Sela feel nothing for this nine-year-old child killed in an Israeli airstrike? Hey stupid – try international laws. Just because they use human shields doesn’t give them a pass. That just makes it another ARAB war crime. Esther Ms Sela’s job is not to express her personal feelings but to highlight the inaccurate, lack of impartiality and incorrect reports and observation of the BBC. All of which are in contravention of their charter. Your attacks on Ms Sela are totally uncalled for as she has nothing to do with the fighting or the results of it. She is holding the BBC to task to maintain accuracy at all times and fulfill its obligations as stated in its charter. Nothing more than this. Oh, great, yet another bigot who thinks Jews are supposed to just accept being bombarded by savages and say “Thank you kindly”. Crawl back under your stone. Dear Hadar, I got the gist of your article but is is not clear to me who is who in the in-law family of the Dutchman. I is also not clear who was in the house exactly and why this house was bombed…was it because this Hamas member was there? or was it because he fired rockets from this house? or was it because 2 members of Hamas were in this house? Dear Hadar, I got the gist of your article but is is not clear to me exactly who is who in the in-law family of the 91 year old Dutchman. It is also not clear who was in the house exactly at the time of bombing and why this house was bombed…was it because this Hamas member was there? or was it because he fired rockets from this house? or was it because not only he but a 2nd member of Hamas was in this house as well? It is not Hadar’s job to provide a family tree or to analyse the IDF’s tactics.